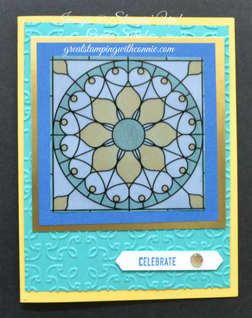 Have you played with the Graceful Glass 6 x 6 Designer Vellum yet? It is beautiful, and makes it easy to create beautiful and unique cards. There are so many ways to use it, coloured with Stampin Blends, Stampin Write Markers, Watercolour Pencils, or even with no colour at all. For this card I decided to use Stampin Blends and I coloured only on the back of the vellum. If you colour on the front of the vellum your colours will be more intense. Both look great and provide options for you depending on the look you want. This particular line design has four squares with this pattern so it is super easy to make multiples of a card quickly. You can colour each square in different colours, cut them out and have a beautiful set of 4 cards that would be perfect for a gift.